In addition, I will follow up with an update by email with fishing conditions about a week prior to your trip. There is plenty more information in this section that I hope you will find useful. If you have completed your trip or have any comment on the service you have received from Fishing Breaks please complete this Feedback Form. In broad terms the river season for trout fishing runs from April to October, with some local variations. The grayling season starts in October and runs through to March, though many rivers close earlier. Stillwater trout lakes stay open all year. Getting around is usually no great problem if you have a car or book one of our Fishing Guides who will provide local transportation. Otherwise a train/taxi combination will usually work. The international airports of Gatwick and Heathrow are within 45-60 miles of the chalkstream region and the local airports are Southampton and Bournemouth. CAR Your confirmation contains maps and the postal address for satellite navigation. However, a word of warning as fishing beats tend to be in the out of the way places which navigation systems have problems with, so do rely on our local map once you get close. CAR HIRE A train/car hire is a good combination if you are coming out of London or from an airport. 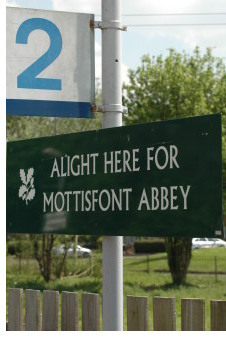 There is an Enterprise office at Winchester train station (Hampshire rivers), Hertz at Salisbury station (Wiltshire), National or Enterprise within walking distance of Newbury station (Berkshire) and Sixt at Dorchester South station (Dorset). TRAIN There are a few beats that are within walking distance of the local train station, but generally you will have to take a taxi from station to river. However, that will not be as difficult as it might sound as over three quarters of our beats are within 5 miles of a railway station. To check which rivers are nearest to train stations click this link. If you arrive by taxi it is a good idea to arrange the pick-up time and place before you send the driver away. All these are within a reasonable distance of our rivers. 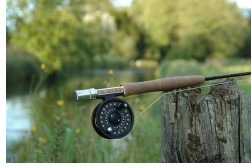 The recommended outfit for the chalkstreams is an 8ft 6inch, 3, 4 or 5-weight rod with a floating line. You should carry tippet/nylon/leader materials down to 3lb. 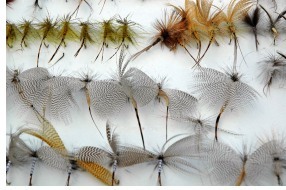 In addition to a selection of dry flies and nymphs, floatant is essential plus a landing net, priest and pliers to de-barb hooks. There is no dress code on our rivers, simply dress for a day outside with waterproofs as a back up. A peaked cap and polarised sunglasses are essential aids to fish spotting. Wear waterproof footwear to cope with wet grass and the occasional soggy patch. Nearly all our beats are fished from the bank. If a beat requires wading it will be stated in your confirmation letter. If you wish to wear waders on non-wading beats for comfort or to assist releasing fish etc. this is fine, but please observe any non-wading instructions. Detailed advice on flies is contained in the Hatch Calendar section. As the chalkstreams take their water from underground springs the rivers are less prone to the to the height and colour fluctuations of spate rivers. That said, the weather may always have an impact, either good or bad, on any fishing trip. It is important to note that all Fishing Breaks fishing is sold on the basis that the client assumes all the risk with regard to weather and river conditions. There are no refunds, exchanges or postponements due to the weather or river conditions. The best weather advice is available from the Met Office web site. Click on this link www.metoffice.gov.uk which has 1-15 day forecasts that can be refined down to the local area. Take a look at our accommodation guide. Your confirmation letter will contain some local recommendations. We do not make accommodation bookings but will offer any advice should you require it. Usually permitted with barbless or de-barbed hooks obligatory. Some beats are all catch and release, but some allow one, two or more fish to be kept. All fishing is upstream dry fly or nymph. On some beats this is essential, some recommended and some not permitted. You must have a valid Rod Fishing Licence in your possession before commencing fishing on any river or lake in England and Wales. 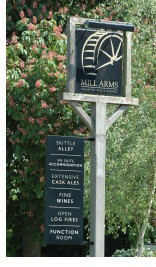 The licence is sold on-line by the Environment Agency, in person from a Royal Mail Post Office or by calling 0344 800 5386. NB If you are using an overseas address you might find the on-line system rejects you. Try using our address as that sometimes works.